I need your help. Yes, I’m talking directly to you. Don’t even think about looking over your shoulder. Well, unless you’ve found yourself at the center of a spy thriller or you’re a conspiracy nut (and by “nut” I mean “thoughtful individual who clearly sees all of those clandestine government plots and truly understands ‘they’re out to get you’”). Anyway, back to the help I need. The great thing about Kickstarter is that once the project is funded, you can receive rewards for your donations. In this case I pledged for a “dare”. Now, I mostly contributed at this level to help him continue to do what he loves doing and that he is quite talented at sharing and well… because I want to continue to live vicariously through his adventures since my big trip at 24 was to mosey around New Orleans and get a hurricane glass from Pat O’Brien’s. WOO! Cheap, tall glass y’all! (I know, I was a wild one.) That being said though, I’d like to make an attempt at a dare, but I’m drawing a big blank. See, I’m at an age where my dares are more along the lines of: “I dare you to go straight home and stop risking your life and worrying your family.” I realize this technically falls under the category of “lame”, but in my defense, and why I’m now turning to you adventurous sorts (again, no need to look over your shoulder, I do mean you), everyone I asked had the exact same reaction (granted, they’re all about my age – we wave canes at one another and curse change – you know the sort). Even people I approached from around the area of the world where he’s traveling gave it some thought and stated coming home was the best adventure. (You know, I kind of thought they’d be good for some off the beaten path kind of ideas.) For the record, he’s traveling around China, Korea, Pakistan, India, Kyrgyzstan to give you some idea. 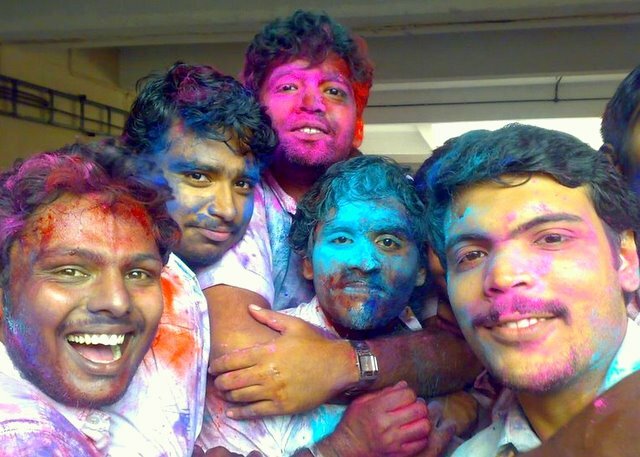 The only “near” adventure I could think of was to have him participate in the celebration of Holi, in India (or Pakistan) but that occurs at the end of this month which is before the project is officially funded (which is also right before April 1st – come to think of it that may be the most appropriate time to propose a dare). So, you worldly travelers, can you think of any offbeat festival to attend, any odd regional food you’d like to see tried (he did try a 1,000 year old egg… there was video proof… umm blech), any fun, ridiculous, inspiring, crazy (yet safe) thing I (and of course by “I” I mean “we”) could suggest? (I’ll definitely post the results here once he’s completed it). Think big! Think fun! Think challenging! Think of what you’d want to do if you were 24 ½! Think of something that doesn’t sounds like, “board a plane back to the United States and become a sensible, contributing member of society so you can die in obscurity like the rest of us – tally ho and such, call your mother” because that would be stealing my idea. This entry was posted in Random Thoughts and tagged adventures, Backpackology, Blogs, dares, Holi, travel. Cool – but brain dead this afternoon (Molly has just eaten yet another mousie – new one that was actually accepted by HRH). But inspiration will strike (It’s St Pat’s weekend as well as a Zydeco festival weekend…so zany is bound to appear. Will return bearing dare…or is that dare to return with bear…anyway thinking thinking…. But I look forward to this bear dare! I really wracked my brain and don’t know those areas well enough – their customs, celebrations, etc to think of anything interesting that would be fun and challenging for someone to do. I welcome all ideas – Creole leprechaun inspired and all! Hope you, the Mauler, HRH and the rest of the gang have a great weekend!